My daughter complains about my homemade guacamole turning brown when I pack it for an after school snack, despite loading it up with lime juice. So I decided to try homogenizing it with my Champion Juicer. It worked! Now she wants me to pack it all the time, so these ingredients have become a staple. 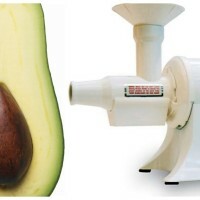 Peel California avocados and remove from seed. Place avocados, jalapeño peppers and purple onion in bowl and add cumin by evenly distributing it across bowl. We pack this guacamole with a side of baked blue corn chips for my daughter’s after school snack. I enjoy adding it to dressings, bean dishes and as a sandwich topping. Eat and enjoy!